We started this project off by designing a print layout for the book. There were photos that needed to be captioned as well as a plethora of footnotes that needed to be checked. We then designed a print and ebook cover with customer’s inspiration in mind. After the print layout was finished and sent to the printer we moved into the ebook conversion stage. This book was a fairly simple reflowing conversion thanks to the print layout; the only thing we had to be careful with was keeping the images looking nice and turning the footnotes into endnotes. We’re really happy with the outcome, both the print and ebook look great. On impulse, Anya accepts a serendipitous invitation to Russia to go on a journey to the other side of the world where her parents were born. Her colleagues ask if she is going back to Russia. How can she go back if she’s never been? Anya is introduced to the expat network. Irma becomes her pedagogue, her friend and guide in St Petersburg. At the end of her first week the White House is torched in Moscow and outbreak of revolution is imminent. Will foreigners be stranded? Will history repeat itself? 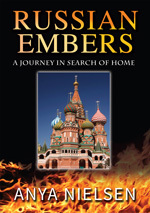 Anya explores the history and culture of Russia to make sense of it all. Years later the art, architecture and music in St Petersburg and Moscow, the churches and monasteries of the fabled Golden Ring towns were reason enough for her to return. This time she was on a quest. It was too late to meet her Godfather but his sister Elena in Ekaterinburg had stories and family recipes to share. Then Anya visited China, the country of her birth. Would she find the source of her longing and discover if the dormant ember long forgotten in her heart would ignite. Would it happen in Russia? Or China? Or at all?